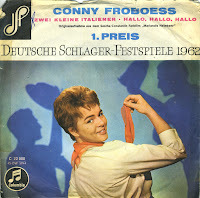 Conny Froboess was born on October 28, 1943. She became a teen idol of the Fifties and early Sixties in Germany. In 1962, she represented Germany during the Eurovision Song Contest with 'Zwei kleine Italiener' ('Two little Italians') . She finished sixth in a field of 16 competitors during the Contest. The lyric of the song describes the plight of two gastarbeiters from Italy who wish to return to their homeland to be with their girlfriends, Tina and Marina. She contrasts this situation with that of the rest of German society (at the time undergoing the Wirtschaftswunder largely as a result of immigrant labour), for whom 'a journey to the South is something chic and fine'. The two Italians, it seems, despair of ever returning to Naples. This unusual subject matter marks the first time that a social issue was described in a Eurovision entry.